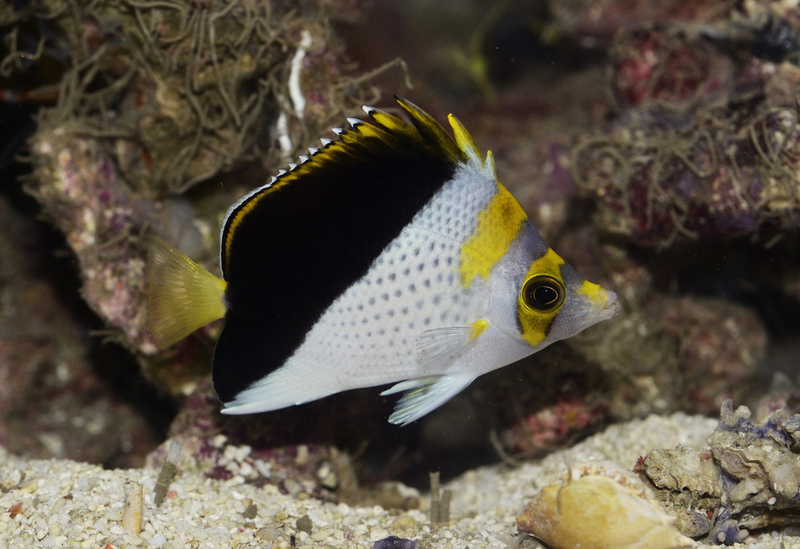 Chaetodon flavocoronatus, the Yellow-crowned Butterflyfish. Photo credit: Lemon TYK. 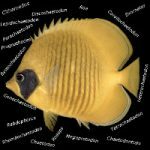 It has been a while since our last installation of epithet etymology, and, to make up for the absence in posts, we’ll feature a truly stunning fish from the butterflyfish genus Chaetodon. In keeping with the theme of these articles, we’ll take a look at the meaning behind the name of this species. Chaetodon is the largest genus in the family Chaetodontidae, which features eleven other genera. The epithet is the combination of the greek words “chaite”, for hair, and “odous”, for teeth. This eludes to the very fine, hair like teeth that are present in all members of this genus. A graphic representation of the Roaops subgenus. Top row, from left to right: Chaetodon tinkeri, C. flavocoronatus & C. burgessi. 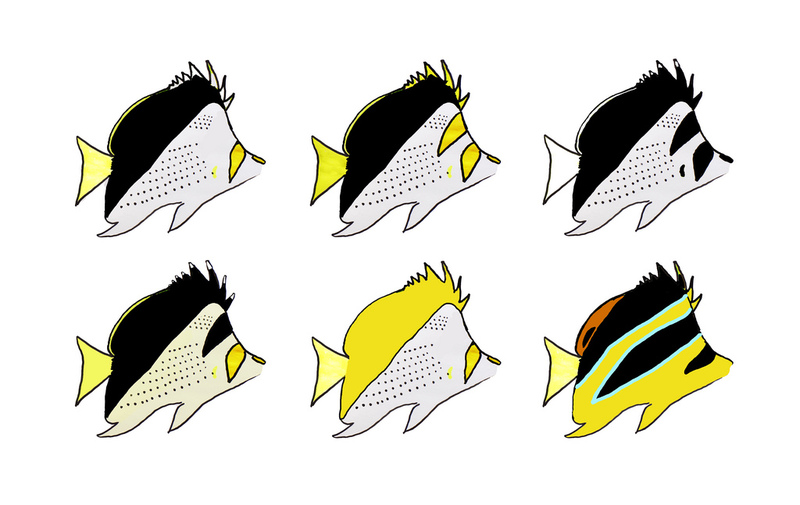 Bottom row, from left to right: C. flavocoronatus hybrid, C. declivis & C. mitratus. Photo credit: Lemon TYK. The specific epithet “flavocoronatus” is the combination of the latin words “flavus”, for yellow, and “corona”, for crown, which is very prominently represented in the species by the presence of a bright yellow band on its nape. C. flavocoronatus is a member of the Roaops subgenus within the genus Chaetodon, which includes four other very similar species. We’ve previously written rather extensively about this subgenus in a magazine article here, so we won’t be going too much into the details of their biology and biogeography. 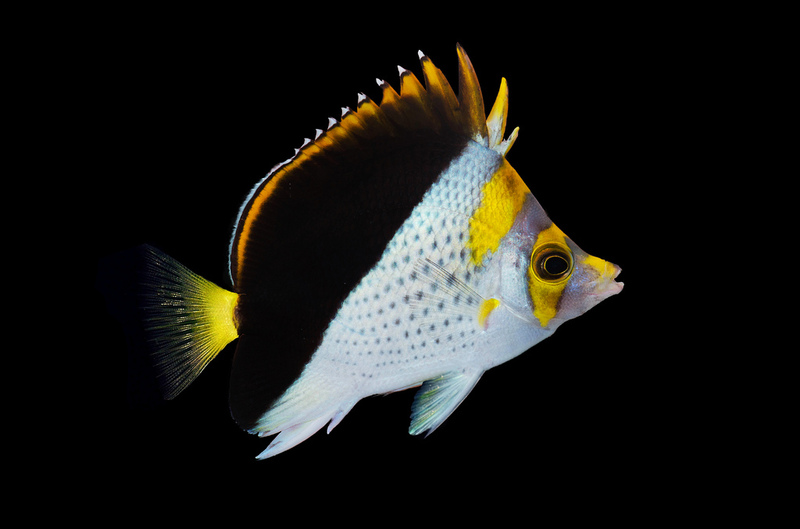 Chaetodon flavocoronatus is, however, the rarest of the five Roaops species, and is endemic to a small region in Guam and the surrounding Mariana Archipelago. It’s elusiveness is, in part, due to its preference for deep reefs in the mesophotic zone, rarely venturing above 50m. Another look at the brilliantly gorgeous C. flavocoronatus. Photo credit: Lemon TYK. What makes this particular specimen so special, however, is that it was collected in Didicas Volcano, Cagayan province, northern Philippines by Barnett Shutman and his divers of RVS Fishworld. 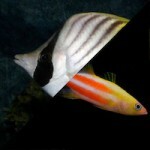 It’s the first time this species has been found here, and probably accounts for the presence of unusual, intermediate phenotypes thought to have arised through hybridization with another closely related species, Chaetodon burgessi – these hybrids often have variably colored crowns and eye stripes that correspond to genetic input from both parents. 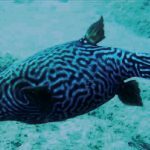 The presence of this species yet again demonstrates the close linkage between the Philippine and Mariana archipelago – a connection that will no doubt continue to feed us with other interesting finds. 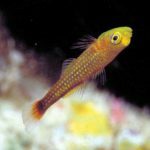 While C. flavocoronatus isn’t exactly a brand new species, it is a fish worthy of exuberant excitement! 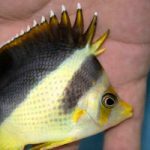 Enjoy these rare, personal photos of the yellow-crowned butterflyfish!